Snooper S2 neo GPS speed camera detector provides alerts to both fixed and mobile speed camera locations via the AURA speed camera database across the UK. The simple and easy to use Snooper S2 neo alerts the user via an audio tone and red or blue LED's depending whether you are driving above or below the speed limit at the speed cameras location. Snooper S2 neo has been discontinued. Accessories are still available for your Snooper S2 neo click here. Snooper S2 neo uses the latest GPS technology to alert you to the presence of all fixed and mobile speed cameras and many officially designated accident hotspots across the UK. The Snooper S2 neo mounts simply and easily to your vehicles dashboard or windscreen and powers from the cigarette lighter socket. Real time updates from Snooper's AURA speed camera database can be downloaded via the Internet (PC required) as often as you like ensuring that your Snooper S2 neo is always up to date. 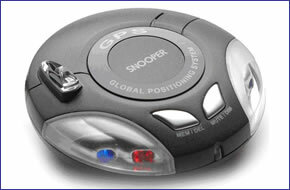 Snooper S2 neo GPS speed camera detector includes two new features, Auto-Ranging and Speed Sensitive visual alerts. You no longer have to set the detection range as the Snooper S2 neo automatically calculates the distance required depending on the speed limit. 200metre pre-warning of a camera in a 30mph zone up to 500metre pre-warning in a 70mph zone. New Speed Sensitive Alerts means that you can safely and easily keep a check on your speed. When approaching a speed camera or high risk zone the Snooper S2 neo will flash the red LED's if you are over the limit or the blue LED's if you are under the limit ensuring that you are always travelling at the correct speed. Upgrades quickly and easily from your PC using AURA speed camera databases ensuring your highest concentration at all times. The Snooper S2 neo, like all Snooper speed camera detectors, gets it speed camera data from the Snooper AURA speed camera database. The database provides advanced warnings to both fixed and mobile speed camera locations across the UK, Europe and in a growing number of other countries across the World. The database is constantly updated with the latest locations. Click here to read more about the AURA speed trap database. Mount the Snooper S2 neo GPS in a suitable position on the dashboard or windscreen and connect it to the vehicles cigarette lighter socket. To download and successfully update the Snooper S2 neo's GPS speed camera database, you will need a PC running either Windows XP (32-Bit), Windows Vista (32-Bit), Windows 7 (32-Bit) with an internet connection. Please note: the S2 neo, as with all Snooper products, is not Apple MAC compatible. Want to add accessories to your Snooper S2 neo? We sell a vast selection of genuine Snooper parts and accessories.